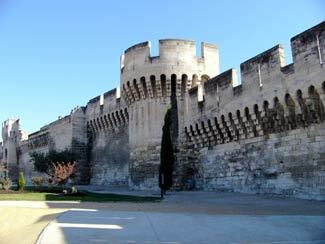 The original city walls of Avignon were razed after a successful siege by Louis XIII and the Pope's armies in 1226. New fortifications were subsequently built without the Church's approval, and those walls were also torn down. Today's ramparts date back to the mid-1300s, when they were built over a 10-year period to protect the city against highwaymen. The walls were expanded and modified over the centuries until France's Monuments Historiques began restoring them in the 1860s. Today they completely surround Avignon's city center, just as they did in the Middle Ages.